Our rich Hickory flavor comes from an old fashioned smoke house. It's always been that way... always will. 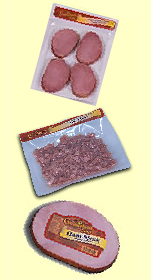 All of our Boneless Hams are carefully trimmed, leaving a product which is up to 97% fat free. This results in a lower fat product sure to please even the most discriminating customer. For our premium products, there's no water forced in to make our hams and steaks heavier. Our brands include Cumberland Gap, Hickory Hills, Olde Kentucky, Olde English and Pine Mountain which are all Naturally Smoked with 100% real hickory wood. 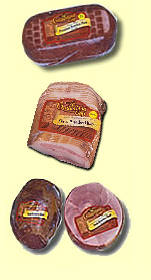 Whole and half hams, specialty diced or chunk hams, premium lines of boneless and semi-boneless hams, spiral cut and deli hams to our smoked pork chops--Cumberland Gap pork products are the perfect solution for today's busy household and corners all your customer's needs!